During April, we focused our attention on the first of the yamas (yogic principles) ahimsa or non-violence. As we move into May we'll be focusing on the second yama; satya. 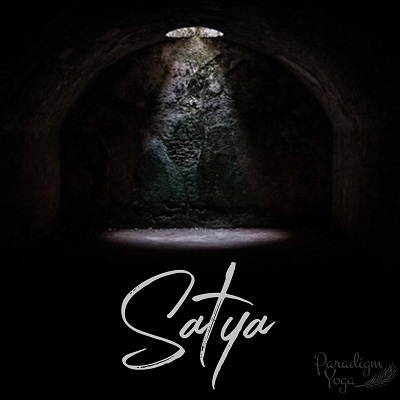 Satya is translated as 'truth'. It should be practiced alongside the the first yama of non violence, so that we do not use the truth in ways that cause other people harm. There are many ways that truth can be explored both in our yoga practice and in daily life, the most obvious being not to lie to people. However, if you dig into the idea of practicing satya it becomes apparent that there is a lot more to this subject than meets the eye. Do you consider yourself to be a truthful person? Have you ever told someone you liked their new hair cut even though you didn't? Do you keep your word and arrive for meetings/appointments/meals on time? Have you ever fibbed to a child to get them to behave? Have you ever embellished or exaggerated a story to make it more exciting or to make yourself seem more heroic, clever or interesting? Have you ever denied doing something so you wouldn't get into trouble? Do you edit and filter photos of yourself before putting them online? Is your social networking profile a truthful reflection of the who you are? Discussions around satya often spiral into the questions of whether then we should be truthful and tell our boss that they drive us crazy, or what to do if your wife/girlfriend/friend/husband puts on something unflattering and asks for your opinion. 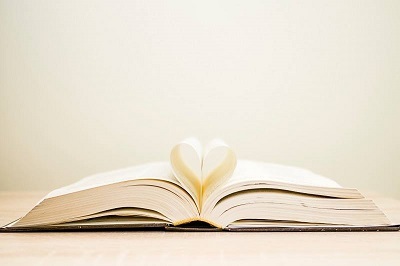 Do we need to open up the books of our lives for all to see? These discussions happen often and are the shield our ego puts up to try and prove that the truth isn't good. This is the ego's last defense because it doesn't want to admit how often we are untruthful, and how often we turn to lies whether big or small for an easy way out, to boost self-image or to be accepted/fit-in. When I read this section of Iyengar's book, I found it refreshing to hear him concede that in the modern day practice of yoga, being nothing but truthful could potentially do more himsa/harm than good in some situations and therefore a more skillful response could be appropriate. 'Truth is not a weapon to be abused, and the sword of truth has two edges so be careful'. He acknowledges that at each stage of our lives we may not be perfect, but we should always do our best in the practice of each of the yamas. During the next 4 weeks we'll be exploring the practice of truth. We'll be referring to the book 'the four agreements' during this time as I believe the 4 agreements tie closely to the practice of satya. Check back daily for blog posts, inspiration and journal prompts. 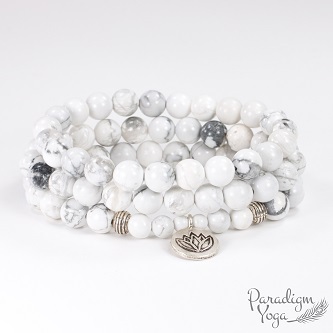 If you are embracing the practice of compassion and gratitude this week and wish to continue over the next weeks and months, white howlite jewelry is the perfect addition to your practice. 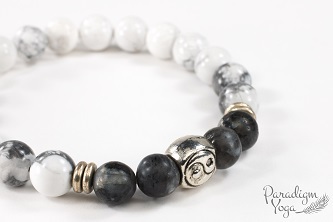 White howlite is a calming stone of wisdom and insight. It calms an overactive mind, reduces stress, encourages patience, and calms turbulent emotions. It helps the wearer to let go of anger, selfishness and criticism, and develop a positive outlook on life. It promotes kindness, compassionate behavior, and peaceful coexistence. White howlite (gloss or matte finish) is available in our online store and studio as a knotted meditation necklace, wrist mala, and in single bracelets and leather wraps. If your size or style is not available, please contact me; I will be happy to make one for you! Gemstone jewelry is a perfect gift, presented in a hand made bag with a description of the gemstones metaphysical properties. 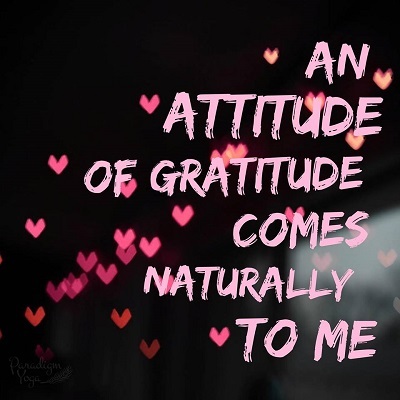 Gratitude is a great way to respond to the little things that can unsettle our minds! Our second mantra this week is one to cultivate gratitude. The more you practice, the more naturally your mind finds the good in situations rather than dwelling in negative, violent or self defeating thought patterns. Our journal questions this week are focused on the practice of gratitude and compassion. Practice ahimsa by finding a few quiet moments in your day for reflection and connection to your inner wisdom. Don't edit as you answer the questions but rather write freely without judgment. What does being compassionate in your daily life mean to you? How can you be more compassionate towards yourself? Are there any people or situations that you could approach with more compassion? Write about a time when your day has been improved by compassionate or kind behavior either by you to someone else, or when someone was kind and compassionate to you. How do you show compassion and understanding to your friends? How many of those compassionate acts could you practice to yourself?